The Library is open on all weekdays, from 9.30 am to 6.00 pm. It is closed on 2nd & 4th Saturdays and public holidays. Mani Bhavan is a simple old-style, two storied building on Laburnum Road, Mumbai. Whenever Gandhiji was in Mumbai between 1917 to 1934, he stayed here. It is now converted into a museum and research centre. Mumbai and its inhabitants have played a very prominent part in India's unique struggle for freedom. Gandhiji was rightly proud of its patriotic and cosmopolitan citizens. Mani Bhavan is one of the few important places hallowed by Mahatma Gandhi's close association. Mani Bhavan, a modest two-storied building on the Laburnum Road in the comparatively quiet locality called Gamdevi, served as Gandhiji's Bombay head-quarters for about seventeen long and eventful years (1917-1934). It belonged to Shri Revashankar Jagjeevan Jhaveri, who was Gandhi's friend and a host during that period. It was from Mani Bhavan that Gandhi initiated Satyagraha against Rowlatt Act and propagated the causes of Swadeshi, Khadi and Hindu-Muslim Unity. In 1955 the building was dedicated as a memorial to Gandhiji and to the very important activities of great significance he initiated from that place. Mani Bhavan has a story to tell as it housed Gandhiji occasionally during the times when he grew in stature and strength, from an agitator to a world figure by successfully introducing satyagraha (individual as well as mass) as a new and effective weapon to fight all evil and injustice. It is obviously impossible to draw the full picture or tell the whole story here. This is an humble attempt to give the reader a few glimpses of the great drama enacted in this small corner of Mumbai by Gandhiji and his illustrious colleagues. To the visitors, it will give an idea of the dynamism of the great Mahatma even while he was shaping himself and the nation, along the uncharted path of non-violent resistance to foreign rule and to all evil. The visitors from all over the world come to Mani Bhavan, to see the Room that Gandhiji occupied, its Picture Gallery, the Library Hall and the Terrace where he was arrested on January 4, 1932. Gandhiji was a dynamic person and he kept on evolving. Even a change in his outward dress indicated an inner change. On his return from South Africa, he flung away the European style of dressing and took to the Indian style. Then again his original Kathiawadi turban was replaced by a Kashmiri cap which in its turn was discarded in favour of a white-cap popularly known as the Gandhi cap. The change ultimately culminated in a bare loin cloth- a significant symbol representing the Indian peasantry and its poverty. Perhaps Mani Bhavan is the only place besides the Sabarmati Ashram, where he donned all these dresses in their sequence. Library consists of around 40,000 books & periodicals in reference and lending sections. 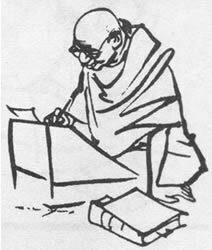 It contains books on and by Gandhi, Gandhian thought, freedom movements and allied subjects. Our Library boasts of many out of print books. The Library is open on all weekdays, from 9.30 am to 6.00 pm. and is closed on second and fourth Saturdays of the month. It remains closed on public holidays. On the first floor is the auditorium where films on Gandhiji are shown from time to time and recordings of his speeches are played on request. It is also used for holding meetings, seminars, discussions and various competitions for school and college students arranged by Mani Bhavan Gandhiji Sangrahalaya and Gandhiji Smarak Nidhi, Mumbai. The room on the second floor which used to be the living room and working place of Gandhiji has been preserved as far as possible in its original setting. Adjoining Gandhiji's Room is the exhibition depicting Gandhiji's life through mini figures in about twenty-eight tableaux, prepared by Smt. Sushila Gokhale-Patel. The rooms on either side of the exhibition have been turned into a Picture Gallery which gives glimpses of Gandhiji in Mani Bhavan and important events in his life. It displays photographic posters depicting important events and Photostats of some significant letters, articles and documents written by and about Gandhiji with appropriate captions in Hindi and English. A few replicas of Gandhiji's belongings and models of his birth place, Sabarmati Ashram, Sevagram Kutir, Phoenix Ashram and his prison cell are also on display. A bronze plaque with an inscription now marks the place of the tent in which Gandhiji was arrested in January, 1932. He used to sleep and hold his prayers on this terrace. The Institute of Research on Gandhian Thought and Rural Development, Mani Bhavan, is recognised as by University of Mumbai. At the sales counter in the entrance hall are sold Gandhi Postage Stamps, Photographs, Gandhian Literature, Statues and other gift articles.